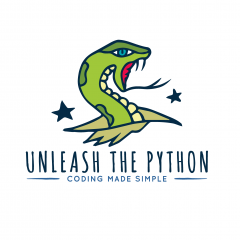 Welcome to Unleash the Python – coding made simple. The Unleash the Python series of books are simple step by step guides to learning the Python programming language. Python Programming for Complete Beginners looks at downloading, installing and setting up Python on your computer. The book discusses variables, data types and control flows. It introduces program decision making with the aid of loops. Chapters’ end with exercises to get you thinking and writing like a programmer. Practical Python Projects is a hands on guide to building real world projects. The book will guide you through the process of building your own real world programs. Exercises are used throughout the chapters to encourage you to think for yourself and give you hands on experience designing and coding programming solutions. Both books are available from Amazon. We are passionate about Python. Our purpose in life is to teach you Python in Plain English. Let us guide you step by step as you embark on your Python journey.